Yesterday as I dropped the kids off at school I noticed that the fog was very thick around the areas where the snow was still on the ground. I took a quick drive out into the country to find some trees to try something out. I wanted to make a moody picture with something of interest in the frame. I really didn’t find much, and I had an appointment in the morning so I settled on this cluster of trees. As I was making my photos I realized that it was not coming out the way that I wanted it to. 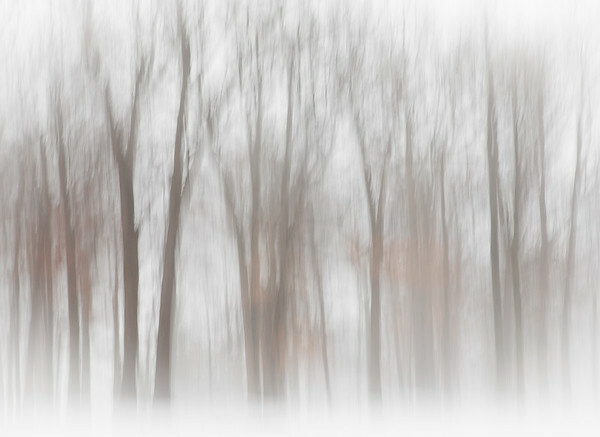 I moved to a slower shutter speed and started panning while making my photo. It created a kind of dreamy effect that I liked here. Maybe this photo was helped along by the score that I was listening to during the entire process. I recently found the Blade Runner 2049 score by Hans Zimmer. It has a dreamy quality to it that really has really helped me be a little more creative in the editing phase of some photos. I have a playlist that I usually edit to called Inspirational Instrumentals. I think some of these Blade Runner tracks will find their way there. Do you have any music that you edit to?